Place all the chopped vegetables and corn in a large bowl. To prepare the dressing, blend together the yogurt and sour cream in small mixing bowl. Add the salt, mustard, pepper, and chili flakes. Whisk well. Taste to check the seasonings. They should be a little on the sharp side. Pour the seasoning into the chopped salad vegetables. Use a spoon to mix in the dressing - ensure that the vegetables are well coated. Throw in the walnuts and pepitas. This salad can be made in advance and will stay well in the refrigerator for 2 days. Remove from the refrigerator a couple of hours before serving. Mix well. I find that if prepared in advance the dressing really seeps in and adds to the flavour of this already yummy salad. Vegan Substitute: Try Soy Yogurt in place of the dairy version for the dressing. Increase the quantity by a quarter cup to cover the sour cream. wow, that looks and sounds yummy, like the sound of yogurt dressing. I dont bother to have this salad even everyday,love yogurt dressing..Yummy salad.. Salad looks refreshing and healthy. This really looks and sounds good. Only, it is cooler than normal here and I just don't feel like eating curds, will save it up for summer. looks so nice and refreshing! 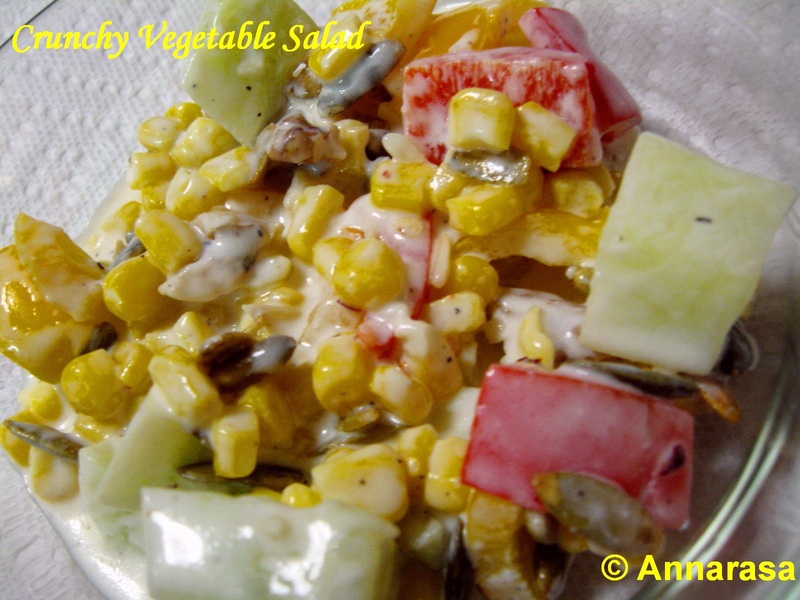 i really relish the idea of using yogurt for the dressing, its low on fat and healthy. @ All: Thanks for stopping by and taking the time to encourage me with all your wonderful comments!! looks yummy n tempting...beautiful colors!